RENEW is all about our communities. Whether it's Newcastle, Gillette or Sheridan, We are just not just involved -- RENEW plays a vital role in each of our respective communities. • A RENEW client in a wheel chair is the "go to" person that the City of Sheridan depends upon for advice on everything from the design of walkways to access to local restaurants. • RENEW/Newcastle is the official recycle headquarters for the City of Newcastle for everything from cardboard to aluminum cans. • RENEW buses in all three of our communities serve as an officially-designated transportation service for local citizens -- not just RENEW clients. • RENEW/Gillette's shredding program provides much needed nesting material for birds at the North Eastern Wyoming Raptor Reserve. • Sheridan clients volunteer countless hours at the local animal shelter. The shelter director says the dogs and cats love the interaction; clients love it too. • If there's a big community event, chances are RENEW is there -- be it Special Olympics at Gillette's Campbell County Rec Center, the annual Wyo Rodeo parade in Sheridan or a Walk for Disability Awareness in Newcastle. 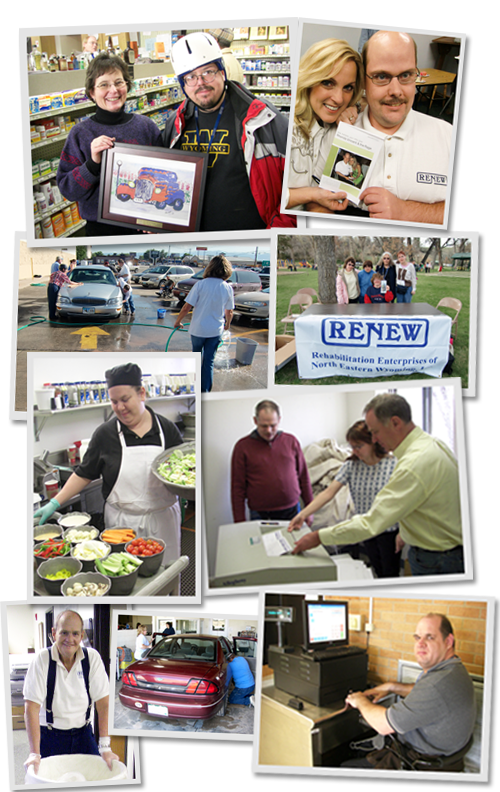 • RENEW clients contribute to the work force in each community -- whether it's serving food at Sheridan College, doing janitorial work at the hospital in Newcastle or bagging groceries in Gillette.